Most patients that undergo LASIK will experience a relatively easy and quick recovery period. How carefully the patient follows all post-surgical instructions following LASIK plays a key role in the length of the recovery period. Patients that diligently follow the post-surgical instructions provided by Dr. Sonny Goel help to ensure a speedier LASIK recovery process. At his eye care practice in Baltimore, Dr. Goel provides patients with a list of LASIK recovery tips to help make the recovery process easier. Stop smoking: Patients must be willing to stop smoking at least two weeks before their scheduled LASIK surgery. They must also be able and willing to refrain from smoking throughout the entire LASIK recovery process. Smoking can slow the healing process of the corneal flap after LASIK surgery. Avoiding potentially dangerous activities: Contact sports such as basketball, soccer, hockey, and football should be avoided for about a month after surgery. These, among other activities, may cause injury or trauma to the eyes. During the healing process, especially in the first few weeks after surgery, the eyes are vulnerable to injury, infection, and trauma. An injury to the eye could result in the corneal flap becoming dislodged or other complications that may slow the healing process. Getting enough rest: It is strongly recommended that patients sleep during the first few hours immediately following surgery. Some patients may be given medication to help them rest after surgery. During the first one to two days after surgery, patients should refrain from using the computer or watching the television for long periods of time. Following the provided medication regimen: Patients will be required to administer eye drops after undergoing surgery. Eye drops are prescribed to help minimize the patient’s risk of infection following surgery and to help reduce inflammation. Protecting the eyes from bright light: Many patients experience sensitivity to light for the first few days following LASIK surgery. Patients should wear sunglasses or other dark glasses when going outside or when in brightly lit areas. Wearing eye shields: For the first one to two weeks after surgery, patients may find it beneficial to wear eye shields when sleeping. Protective eye shields prevent a person from rubbing his or her eyes while sleeping. Not rubbing the eyes: Many patients experience a strong, unwavering urge to rub their eyes during the LASIK recovery process. Unfortunately, rubbing or touching the eyes may affect the results of the LASIK surgery. Rubbing the eyes introduces bacteria to the eyes; this can increase the risk for infection following surgery. Eye rubbing may also cause the corneal flap to not heal properly. Steering clear of eye products: All eye products not prescribed or recommended by the patient’s surgeon should be avoided during the first two weeks following surgery. 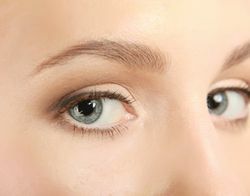 Eye products that should be avoided include creams, cleansers, lotions, and make-up. Taking showers: It is important that patients do not get water, shampoo, or soap in their eyes while bathing. We recommend that patients take showers instead of baths for the first two weeks following surgery. Keeping all follow-up appointments: The purpose of follow-up appointments is to ensure that the eyes are healing properly after surgery. If you would like to learn more about LASIK and recovering from laser eye surgery, please contact Dr. Sonny Goel today.